The EyeWriter is a low-cost eye-tracking apparatus + custom software that allows graffiti writers and artists with paralysis resulting from Amyotrophic Lateral Sclerosis to draw using only their eyes. Since that first video, we've been hacking on and developing the project, and we have a new design, which we've called "eyewriter 2.0" which improves the accuracy of the device, and allow for people who's heads are moving slightly to also use an eye tracker. The original eyewriter, designed for a paralyzed Graffiti artist TEMPT1, is designed to be worn on a completely motionless head. The 2.0 design, which uses a camera and LED system mounted away from the head, can be used by people whose heads are moving slightly, such as MS patients, and people who wear glasses, etc. 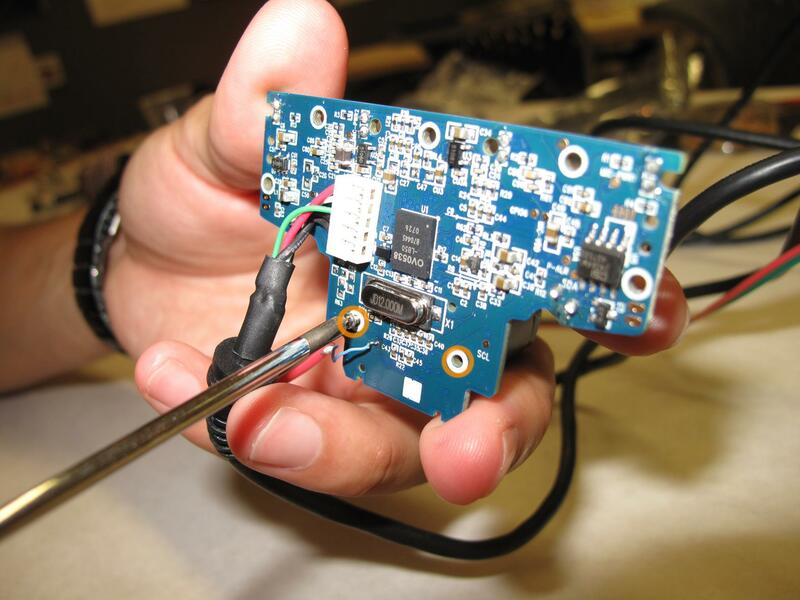 This eyewriter system is cheap, and completely open source. At the moment, it costs about 200$ in parts. Traditional commercial eye trackers costs between $9000-$20,000, so this is a magnitude of order cheaper, and is designed to help anyone who wants or needs an eyetracker. The basic idea approach is that we'll be doing a few things. 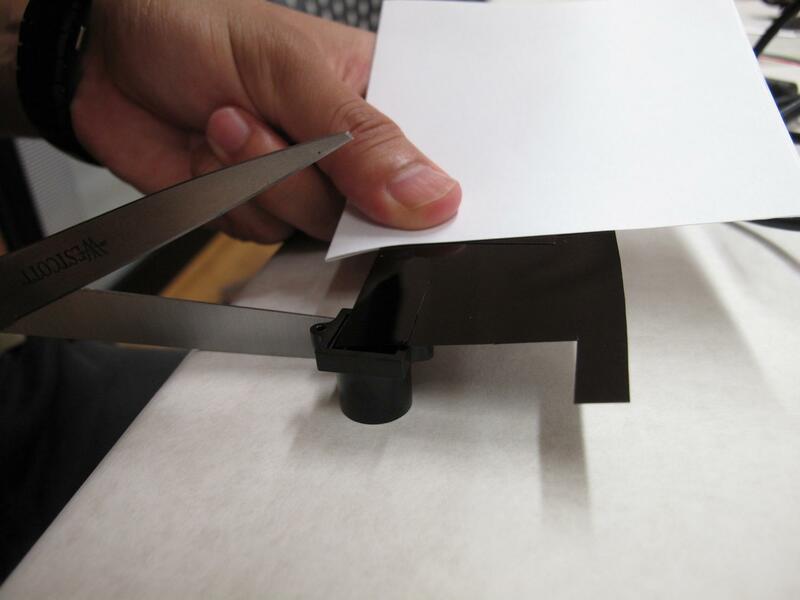 First, we'll be making LED illuminators for the sides of the screen and the center. 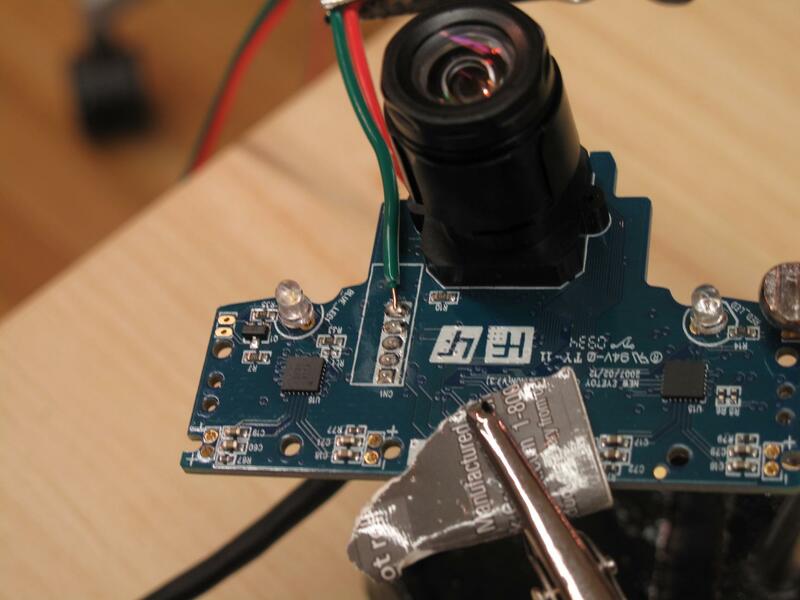 Second, we'll be hacking the PS3 eye camera to get the vertical sync (when the frame of video is being taken) and to make it sensative to IR. 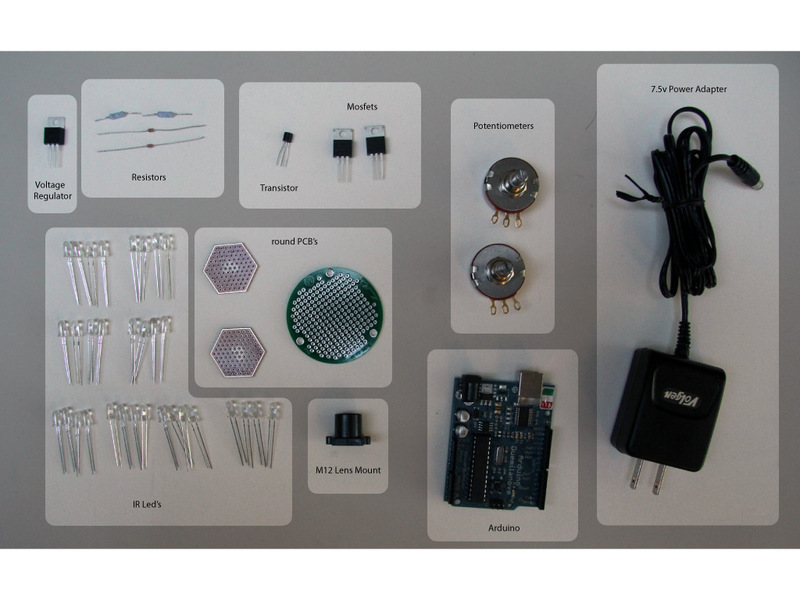 Third, we'll be programming and building the arduino / cirucit to control the blinking. Finally, we'll setup the base for the system and go through the basics of the software. 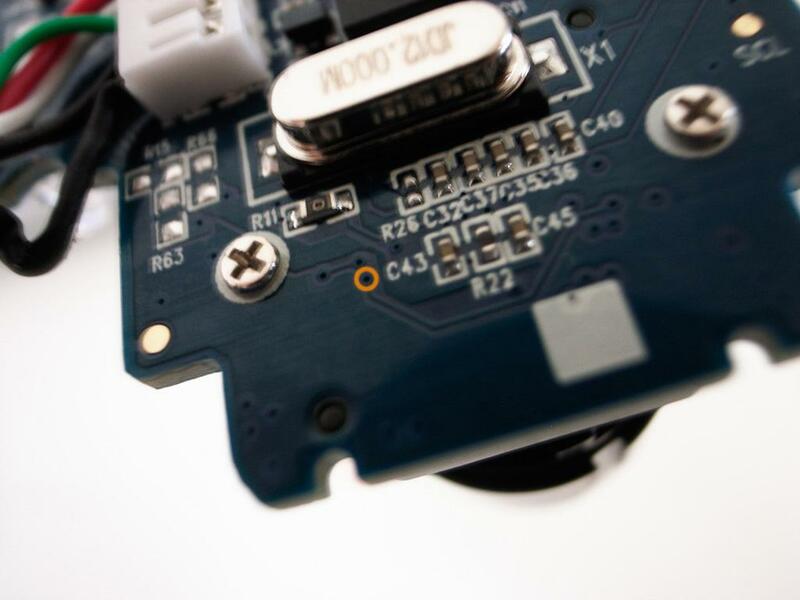 From a technical perspective, the 2.0 system works by strobing 3 IR illuminators every frame. On even frames, it uses the center illuminator (located around the camera lens) and on odd frames it uses the 2 side illuminators. On even frames, the pupil appears bright, since the IR light is actually bouncing off the back of your eye, like red eye effect. On odd frames, your pupil appears dark. 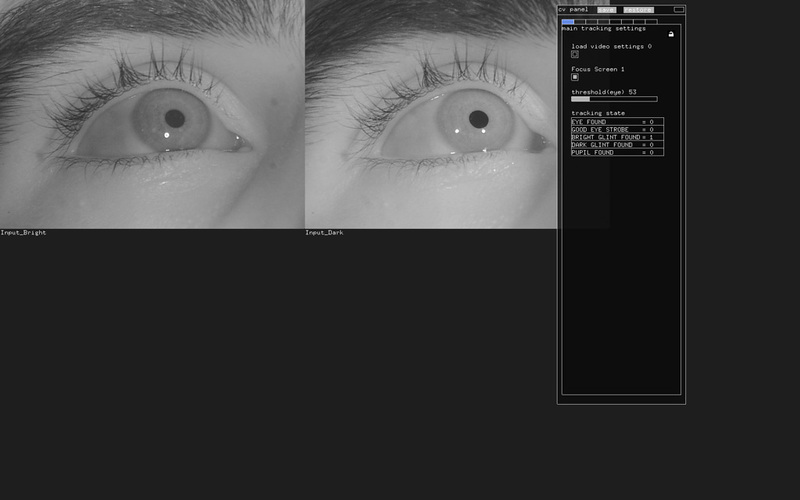 The difference between the two allows us to isolate and track the pupil in realtime. 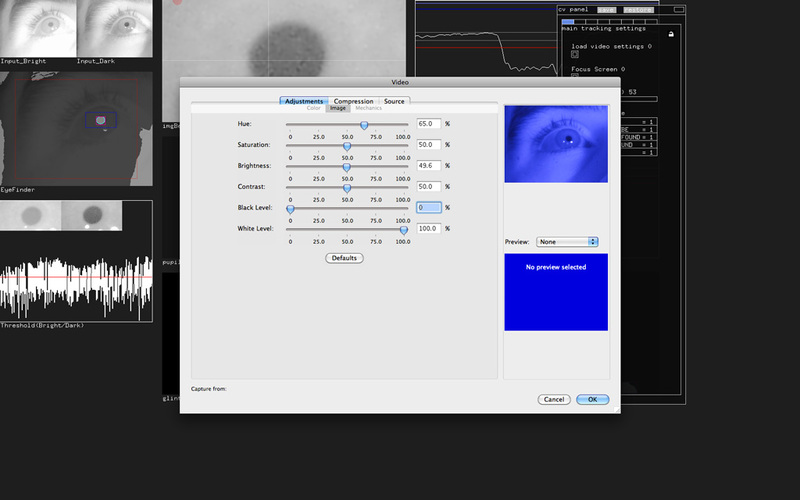 Additionally, the glints (reflections of the IR illuminators) of the dark frame are tracked, and these, plus the info on the pupil, is calibrated to screen position using a least squares fitting process for an equation that provides a mapping of glint/pupil position to screen position. 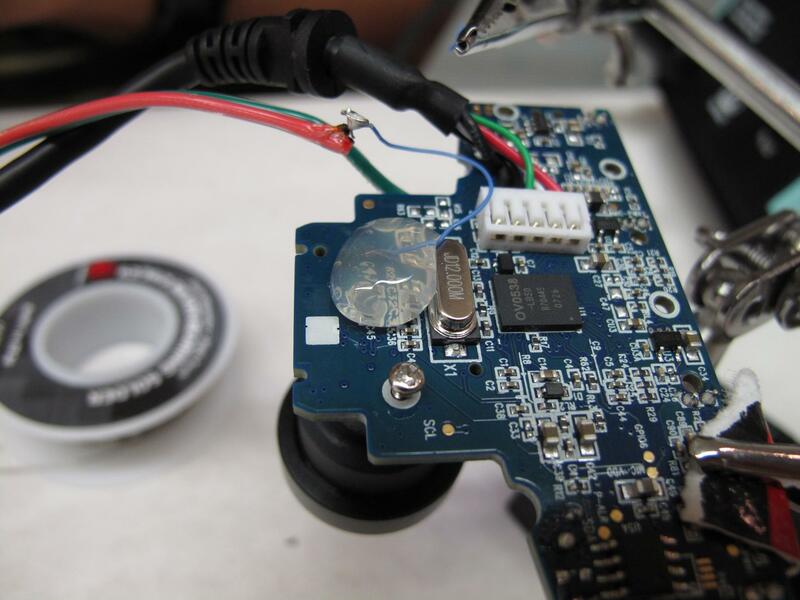 The Eyewriter 2.0 requires a few pieces of software for building and running. In this step we will explain how to download and install an IDE, openFrameworks, and the eyeWriter software. Download and install an Integrated Development Environment (IDE) to run openFrameworks if necessary. Download and install openFrameworks if necessary. GitHub is a web-based hosting service for projects that use the Git revision control system. It is a platform that allows people to exchange and share code. Visit the EyeWriter source page on GitHub. Click Download Source on the top right menu. After download is complete, unzip the file and place the "eyewriter-xxxxxxx" folder into openFrameworks "apps" folder. Open the "apps/eyewriter-xxxxxxx/eyeWriterTracker/RemoteEyeTracker.xcodeproj" file to test that all installations are working correctly. The source code should load in your IDE software. Build and Run the source code. The Tracking screen should load in video demo mode. We will also need to install two additional pieces of hardware. Macam will allow our PS3 eye camera to talk to our computer and the Arduino software will permit our physical hardware to communicate with our software. Macam is a driver for USB webcams on Mac OS X. 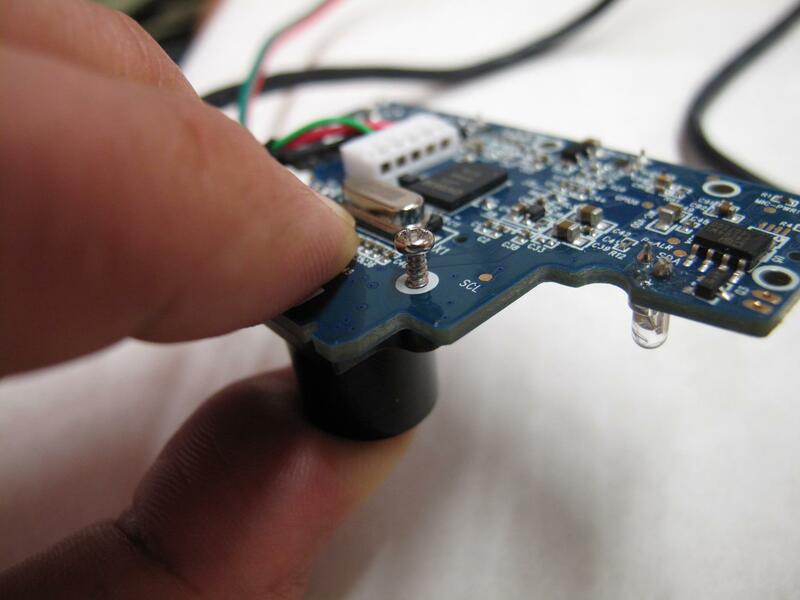 It allows hundreds of USB webcams to be used by many Mac OS X video-aware applications. Since we are using a PS3 camera, this software will allow our computers to recognize the hardware. 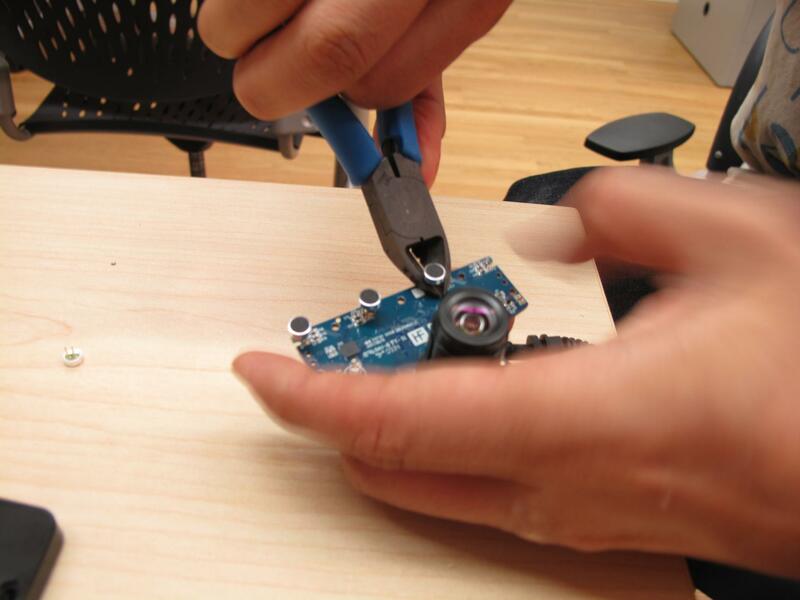 In this step you will have to load the Arduino sketch for the PS eye camera to work. Load the Arduino EyeWriter sketch "apps/eyewriter-xxxxxxx/eyeWriterTracker/StrobeEye/StrobeEye.pde" in the Arduino IDE software. This needs to be done in order that the eyewritter software can recognize the hardware. 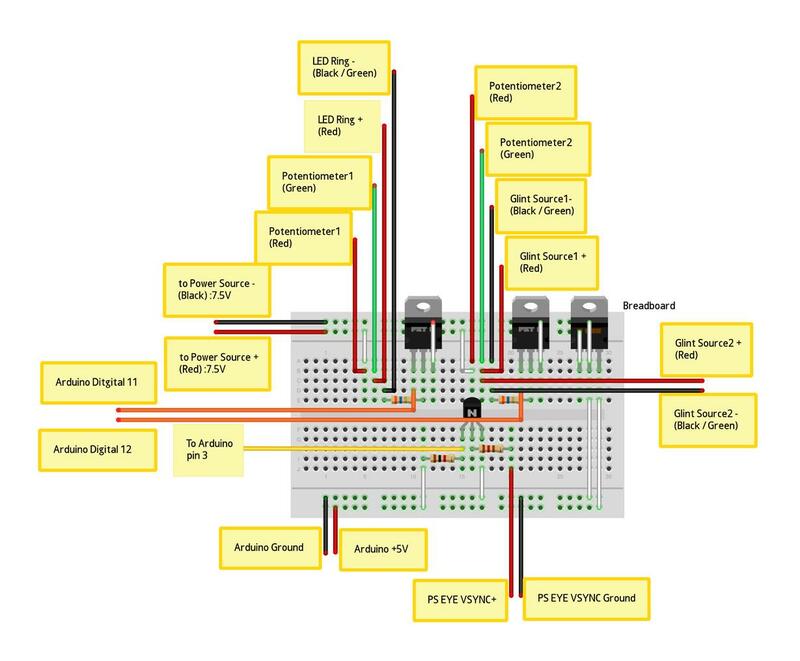 With your Arduino board connected, upload the sketch to your board. 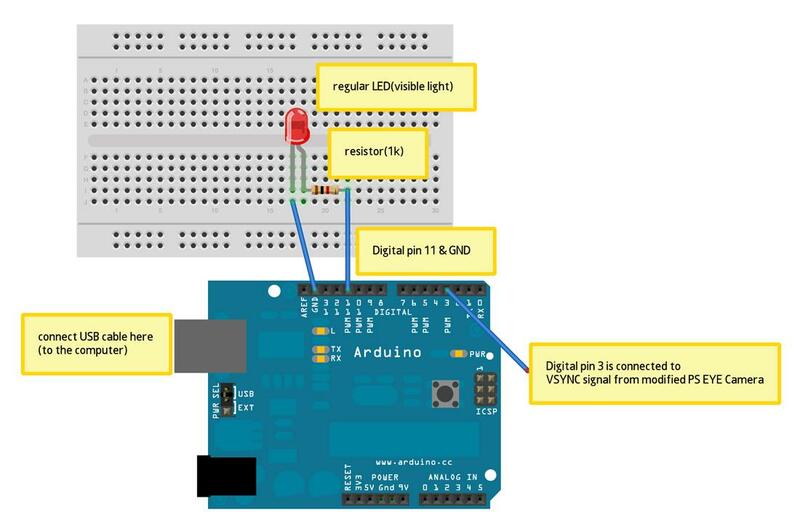 Follow the Getting Started tips if you're unfamiliar with the Arduino environment. 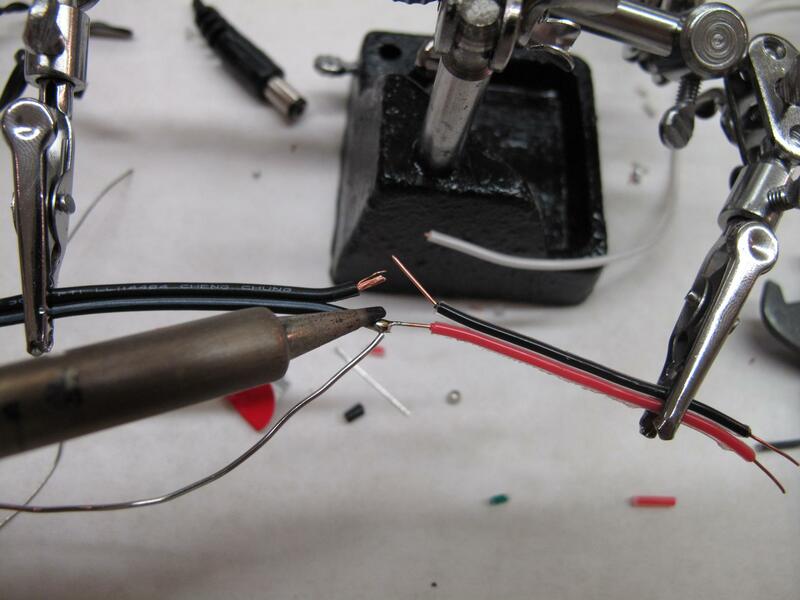 Use a Voltmeter to determine the positive and negative wires in the adapters exposed cord. 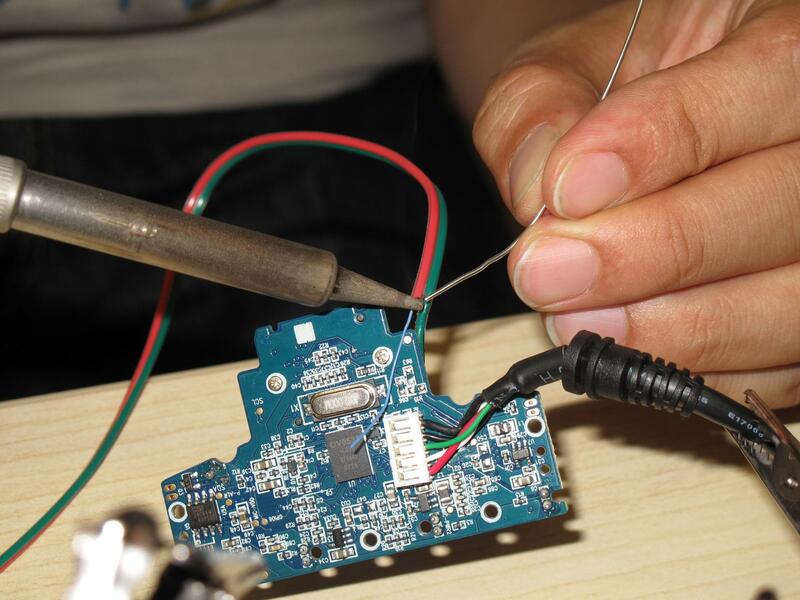 Using a short strip of red and black wire, solder the red wire to the adapters positive wire, and solder the black wire to the adapters negative wire. Tape the exposed wires separately to keep positive and negative apart, then tape both together to ensure no wire is exposed. 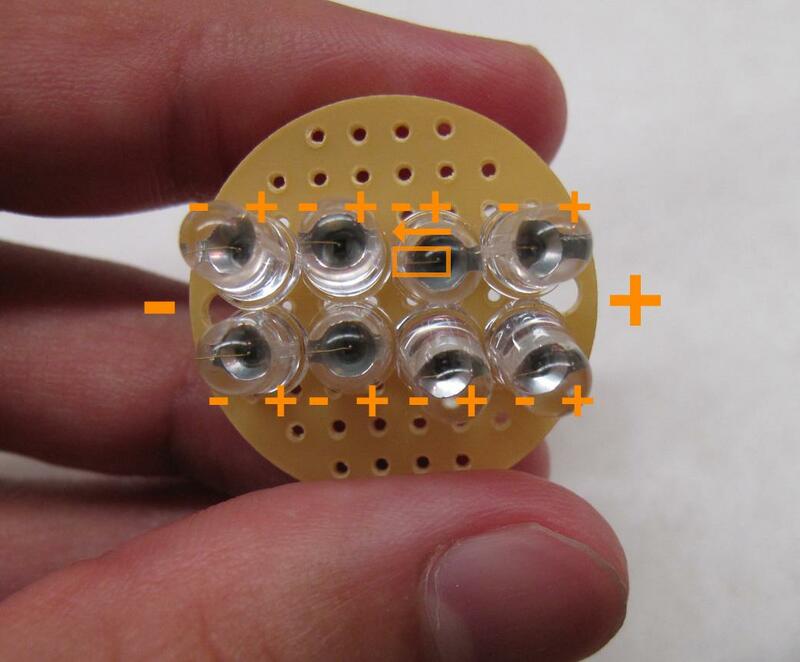 Gather 8 Infrared (IR) Light-Emitting Diodes (LED) and a small round Printed Circuit Board (PCB). 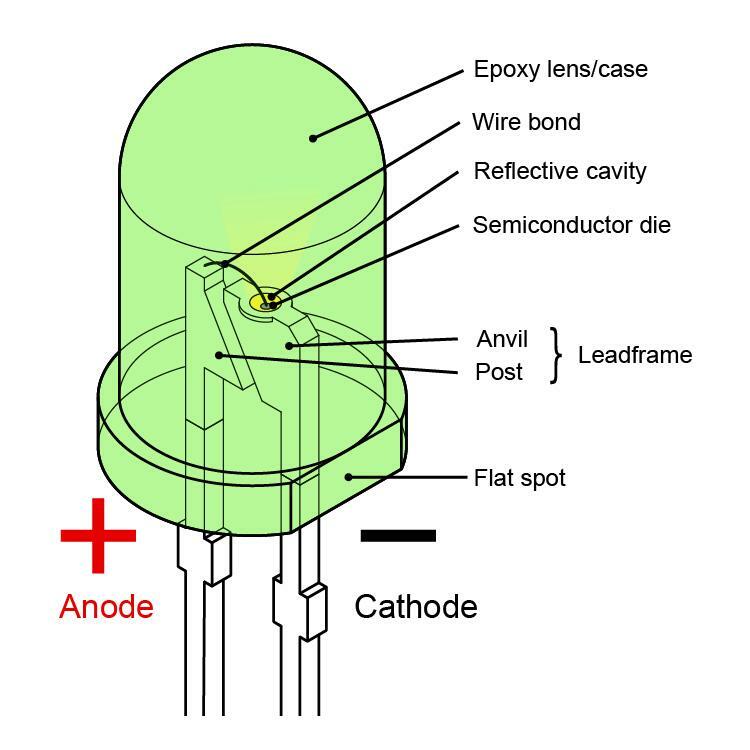 On most LEDs, there will also be a flat spot on the cathodes side of the lens. From overhead, take note of which direction the wire bond points relative to positive and negative. 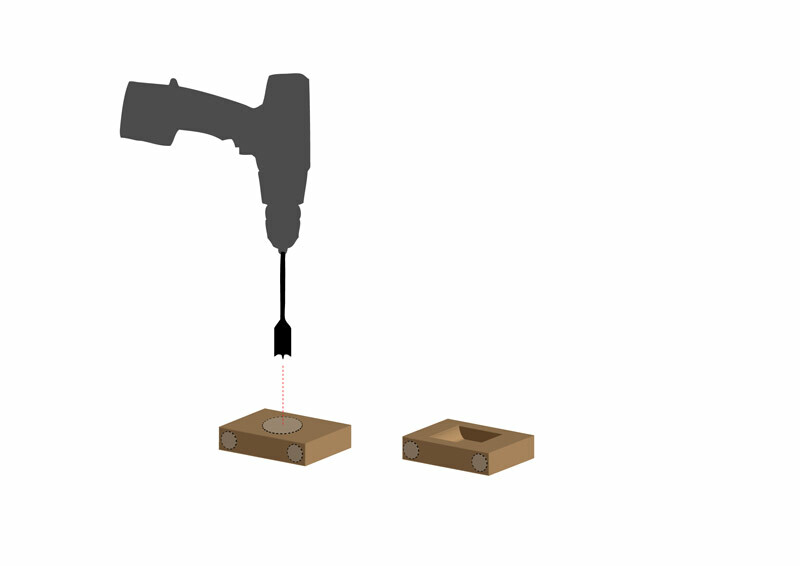 Setup a circuit of 4 LEDs in series, in parallel with another set of 4 LEDs in series.see image here Clip the legs of the LEDs and solder them together. 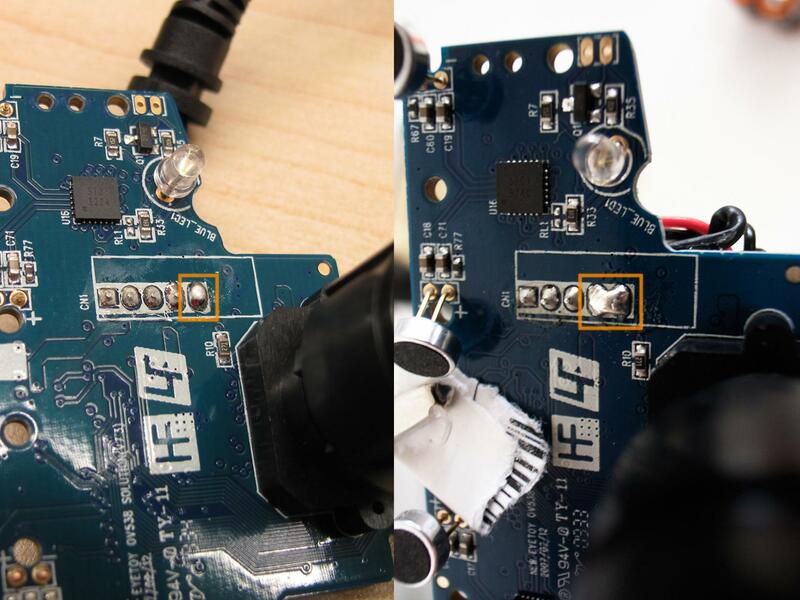 After confirming your IR LEDs are working, cover the back of the LED PCB panel with hot glue to keep all connections in place. 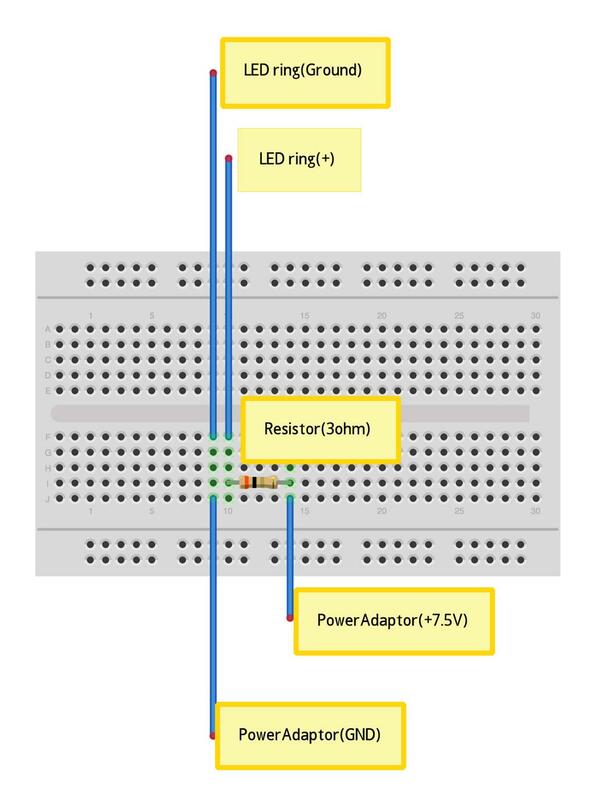 Repeat steps 1 - 5 above to create another LED PCB panel. Solder about 2 feet (60 centimeters) of the red & green intercom wire to the LED circuits positive & negative ends. 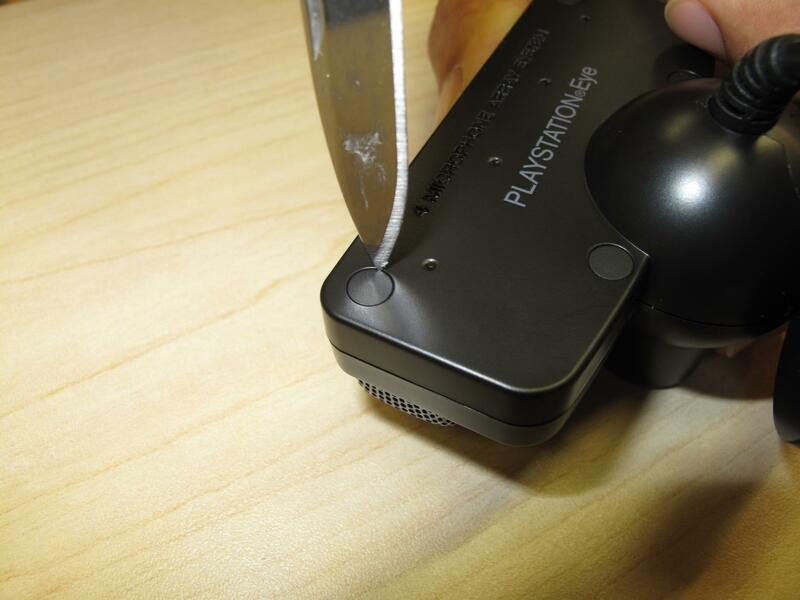 In this step we will talk about how to take apart a PS Eye camera. 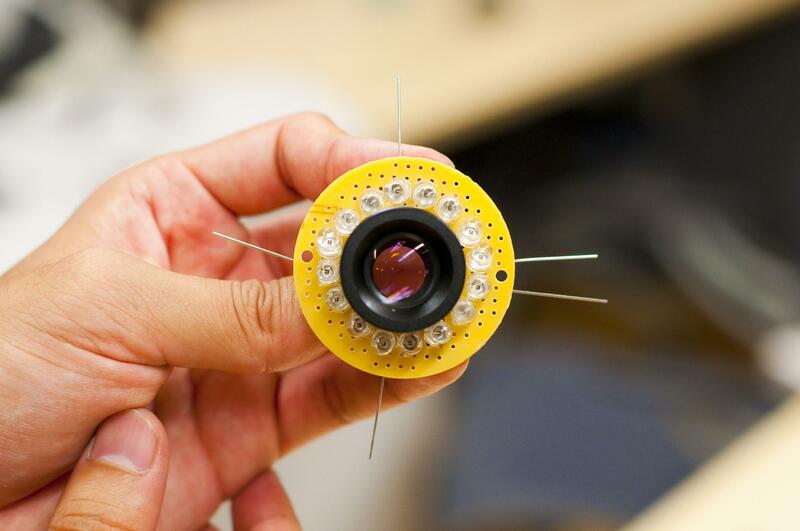 This is necessary for you to be able to replace the lens on the camera, insert a infrared filter and wire the v-sync. Get a PlayStation (PS) Eye camera. Use at your own risk because the camera will undergo modifications voiding its warranty. Unscrew the four screws underneath where the screw caps were. Keep these screws because you will need some later. 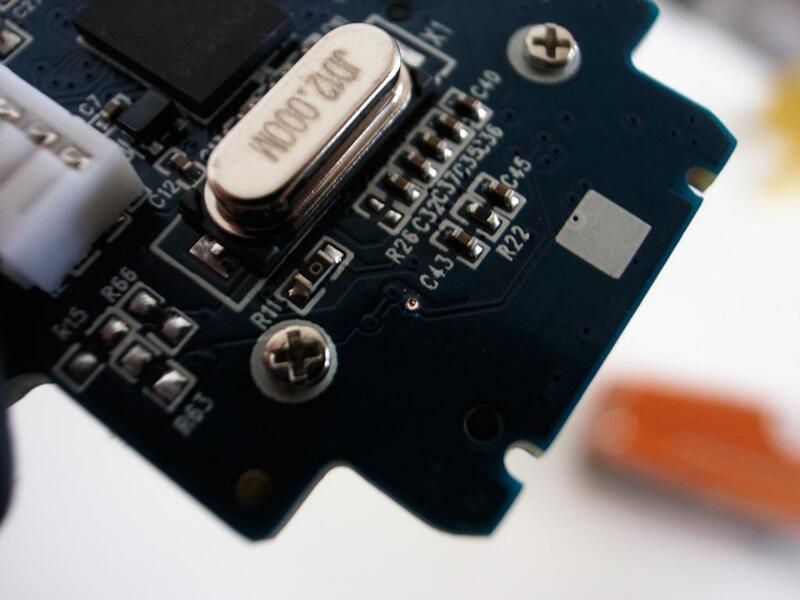 With all five screws removed, lift the board out of the front casing. 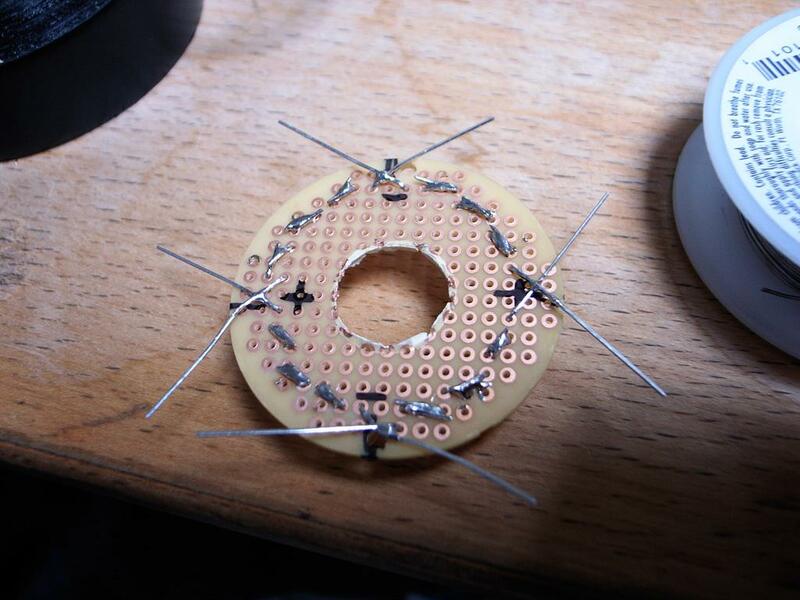 Now the PS Eye board is prepared for wiring. 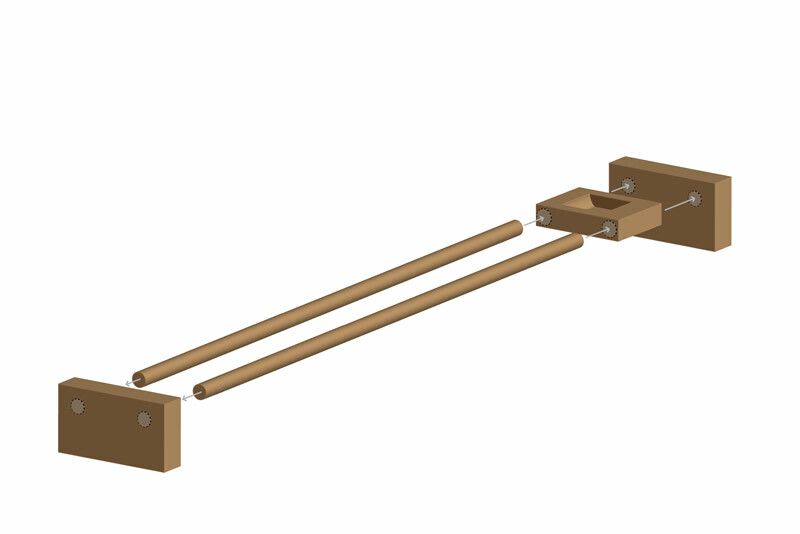 The next steps will connect wiring to the Vertical Synchronization (V-Sync) and Ground joints on the PS Eye board. In this step we will go through getting the v-sync off the camera. The v-sync is an electrical signal that comes from the camera which communicates the camera's refresh rate. Getting the camera's v-sync is crucial for this application to work because it is the only way we can match the camera's refresh rate to our infrared LED's. Cut about 2 feet (60 centimeters) of your 4-color intercom wire, and split the red and green from the black and white. Split the red and green wire about 2 inches (5 centimeters) from one end, and strip off a small section of insulation at the end of the green wire. The green wire will be soldered to the PS Eyes Ground joint. 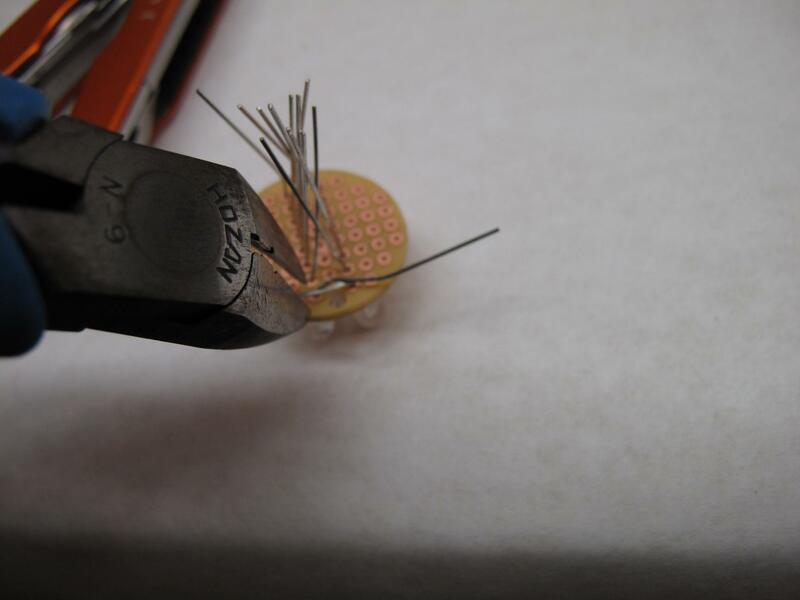 Solder the green wire to the PS Eyes Ground joint. 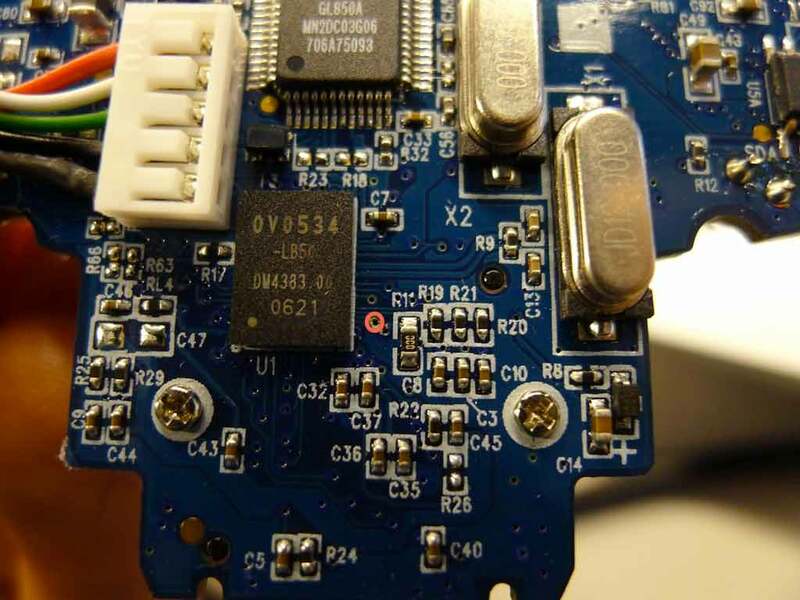 The red wire needs to connect to the exposed V-Sync via, but the wire is too thick to be soldered neatly to the small via, so a 30 gauge wire will be used in between. 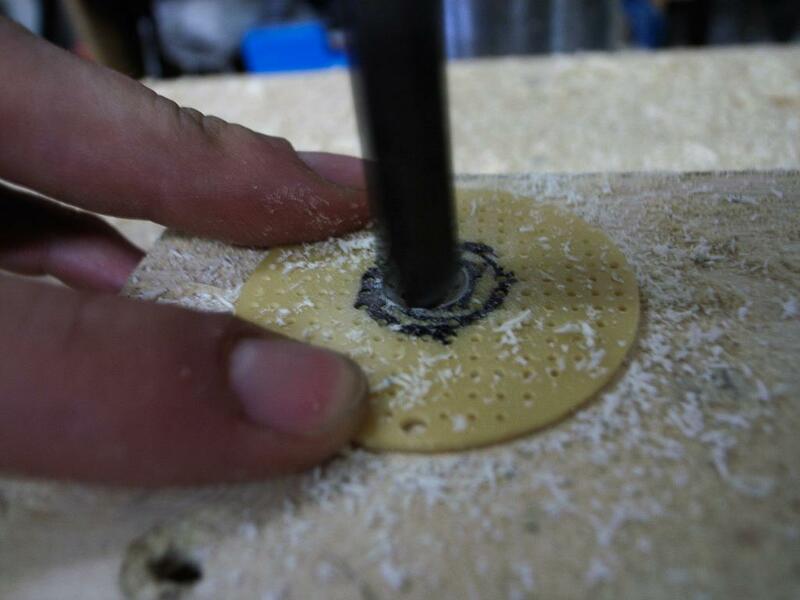 Strip the ends of a 2 piece of 30 gauge wire. 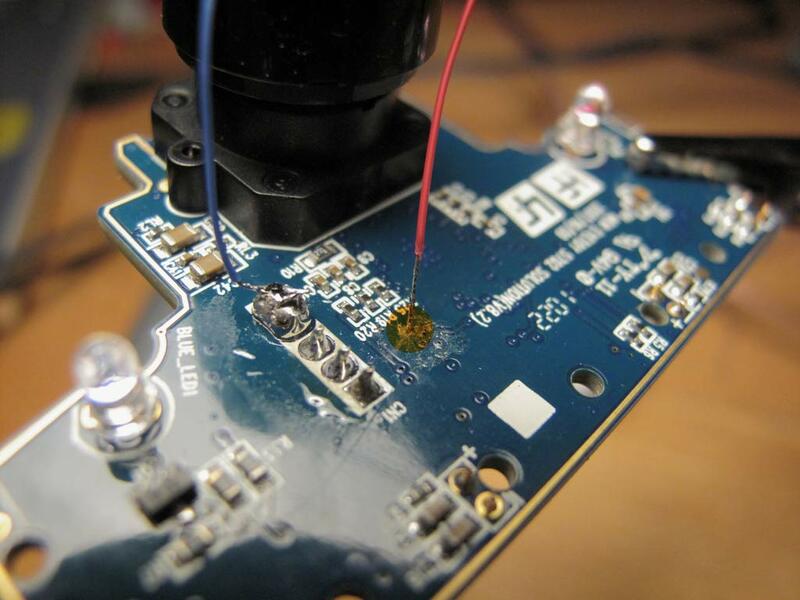 Using thin 0.022 inch (0.56 millimeters) solder, carefully solder the 30 gauge wire to the exposed V-Sync via. To confirm, ensure the LED on the breadboard is flickering. In this step we will talk about how to put your camera back into one piece. Screw the new lens into the new lens mount on the board. 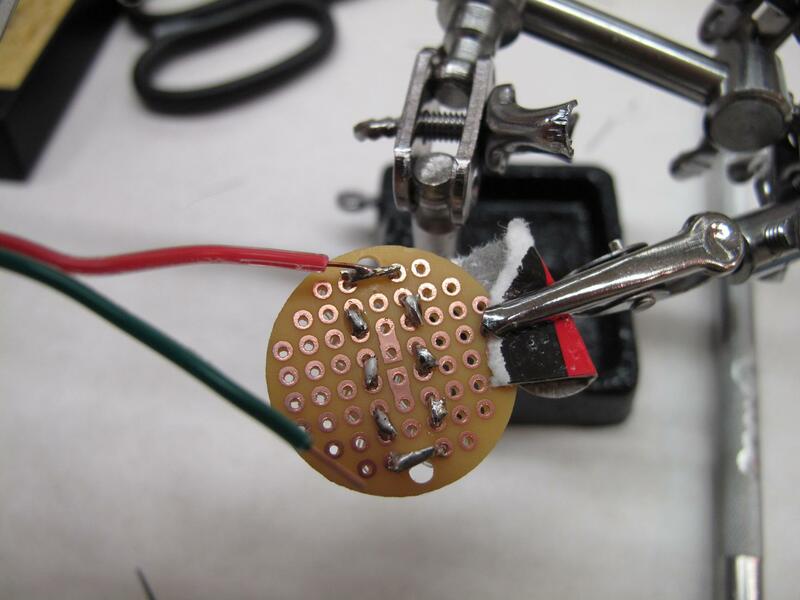 In this step we will show how to put together the circuit on the breadboard. 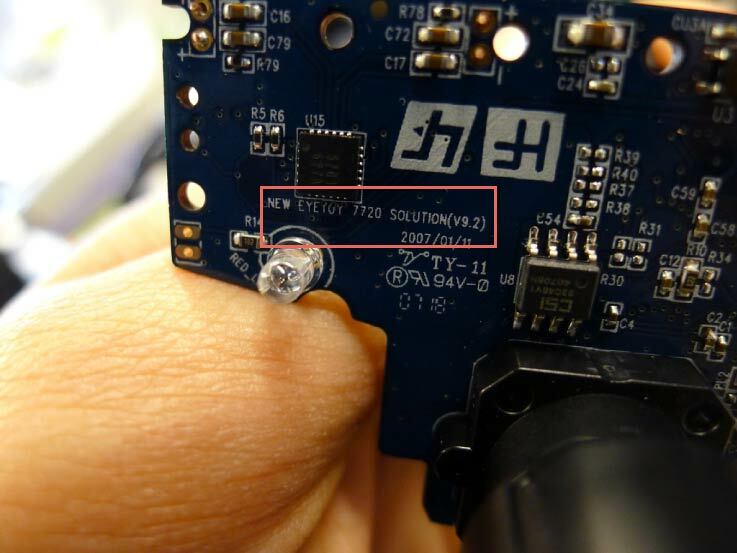 This is the initial step to getting your Arduino to work with the eyeWriter software. tag from 1 to 0. Open the "apps/eyewriter-xxxxxxx/eyeWriterTracker/RemoteEyeTracker.xcodeprof" file, and Build and Run the source code. The Tracking screen should load with input from the PS Eye camera. 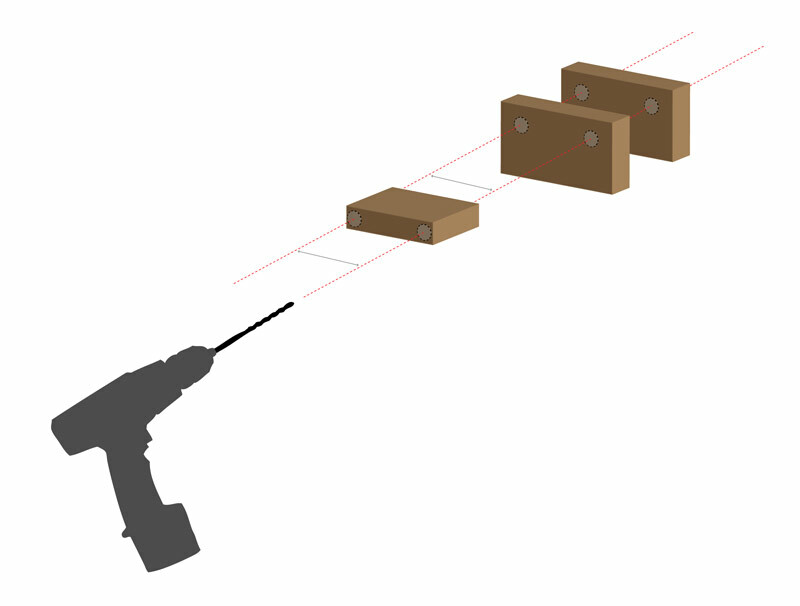 In this step we talk about building a portable wood base. It is interesting to build this so that your system can have a stable infrastructure to rest on. 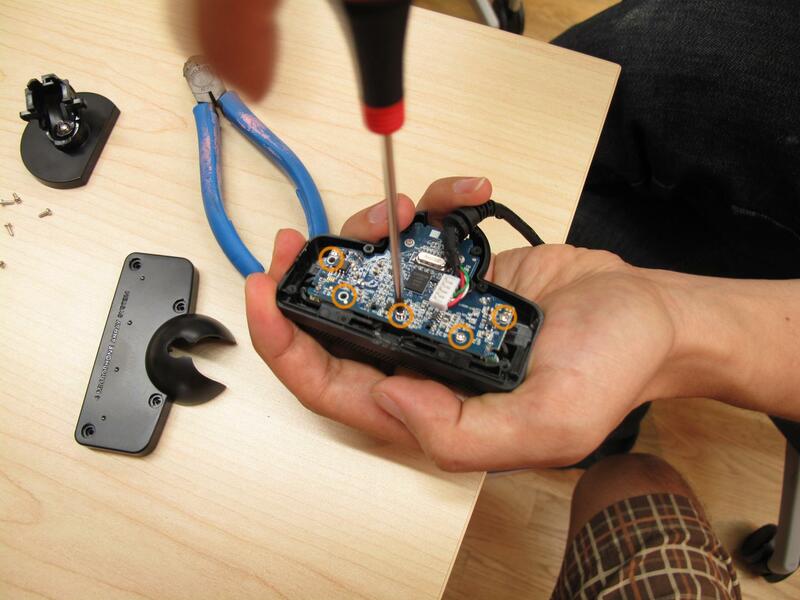 This makes it easier to test, calibrate, and work with the eyeWriter. 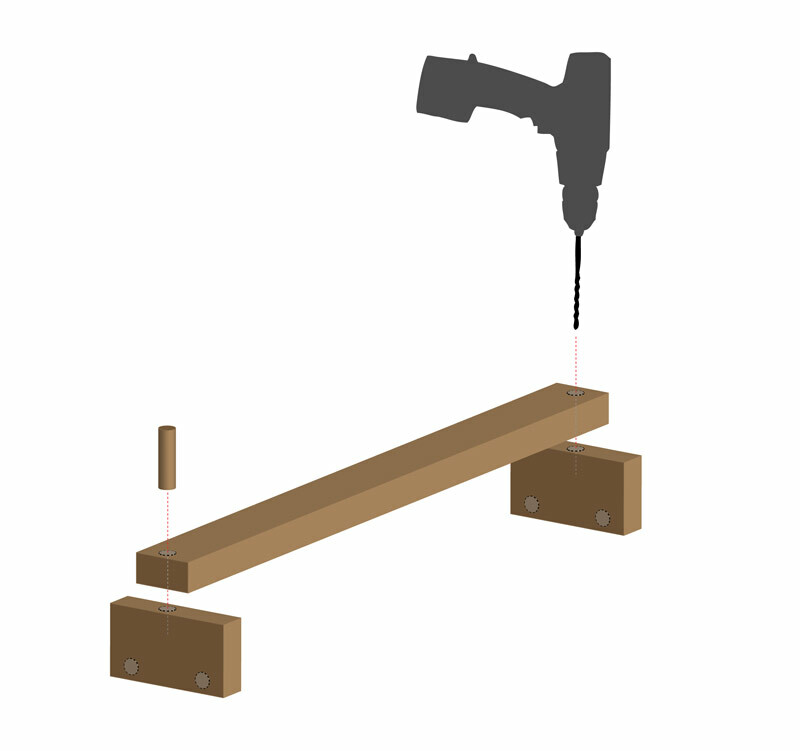 using the two pieces (C) that have the same holes aligned, place each of them on the edges of the piece (B), clamp the aligned (see picture for example) and drill a hole through them till about 1 1/2 inch deep on the (B) piece. In this step we will take you around the eyeWriter software so that you can set it up. to return to the Tracking screen. on the first tab of the right panel. settings back and forth until the video looks ideal. tab, if youre using a faster computer set your Frames per second (Fps) to 30. If youre using a slower computer set your Fps to 15. In this step we will go through the calibration setup. Press spacebar for instructions, then spacebar again to start. Look at the red dots as they appear. At the end of the calibration, the blue lines show any calibration inaccuracies. If there are any long blue lines, reset the calibration and press spacebar to start again. box. As you stare, the boxs color will turn green. and will appear somewhere else. Keep catching the boxes to test your eye-tracking calibration. Drawing mode starts paused by default. 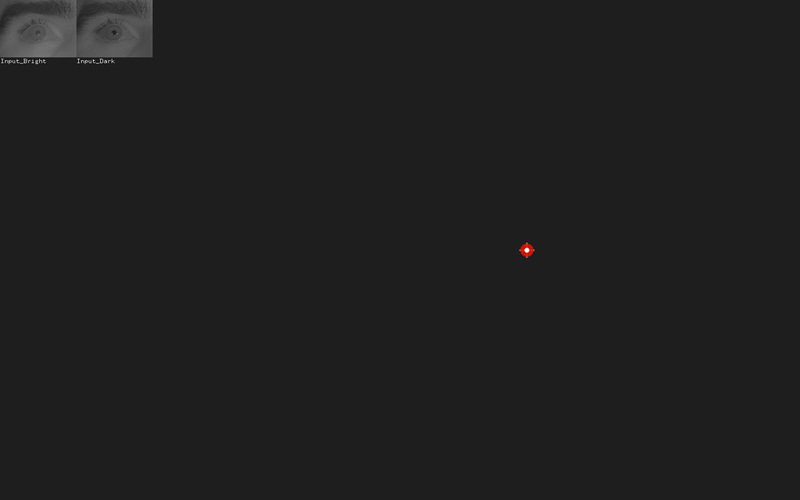 Before you start drawing, you can toggle the background grid on or off. 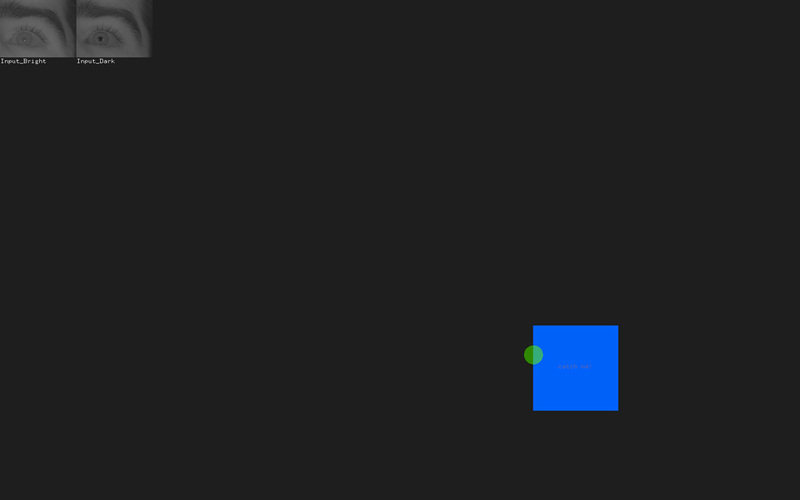 The background grid can be toggled at any time by pausing. Drawing works with vector points. Stare at a place on the canvas for about a second to make a point. Your green eye-tracking circle needs to stay very still to make a point. which removes the entire last stroke drawn.
. Your recently drawn letter will appear at the top of the screen, and you have a new blank canvas to draw a new letter on. to move on to Positioning mode. 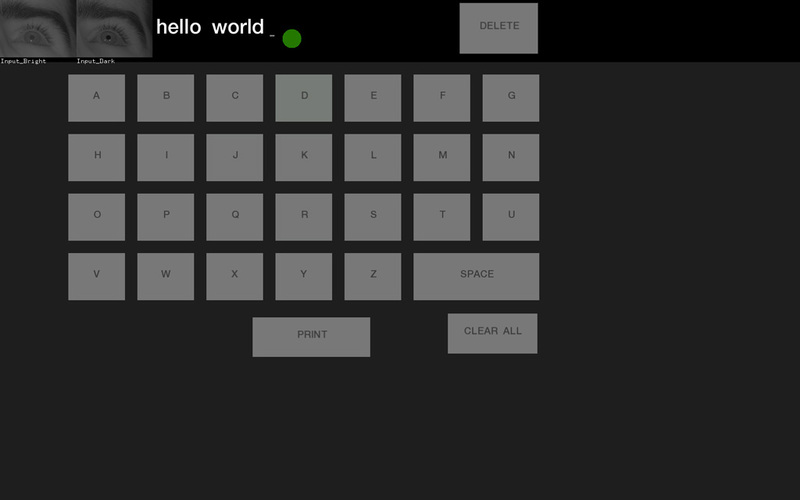 allows you to rotate your selection right (clockwise) and left (counter-clockwise). allows you to move your selection up, down, left and right. which shrinks and enlarges your selection. will place your letters side by side in the order you drew them. to move on to Effects mode. Stare at whichever key you wish to press. As you stare, the keys color will turn green then flash blue. When the key flashes blue, it has been pressed. You can see what youve typed at the top of the screen. toggles the option to speak words automatically after they are typed and a space is entered. key on the bottom right of the screen. This toggles caps lock on and off, and is required to use the alternate characters on the number keys (! @ # $ % etc). 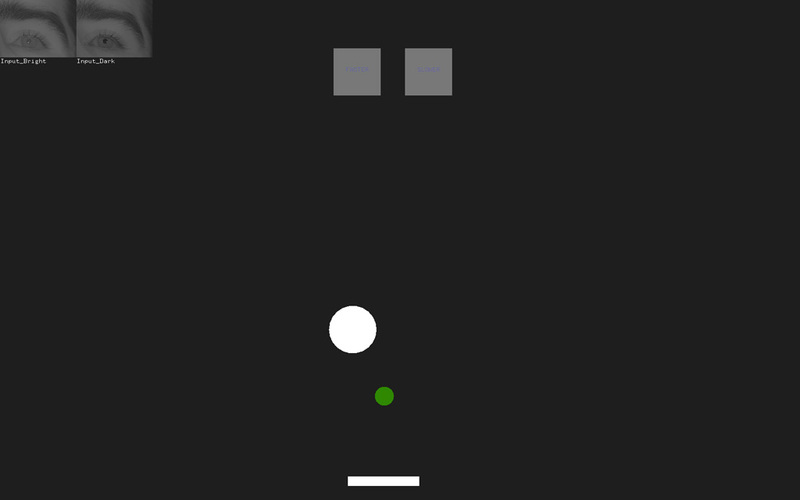 The goal is to block the ball from passing your paddle at the bottom of the screen. The paddle will slide aligned with the x-position of your gaze. So you can stare at the moving ball and the paddle will slide horizontally in tandem. We are making this project but are stuck on step 14, the calibration stage. We are not getting blue lines. Any tips? can you tell me the correct lens link used in this project . i done all hardware but lens gives me bag video.and tell me how to find calibration stage. please respond by Sunday, April 2nd. Thanks!!! Hola me llamo José tengo ELA y ahora estoy usando este programa que se llama Enable Viacam, es muy facil de usar. 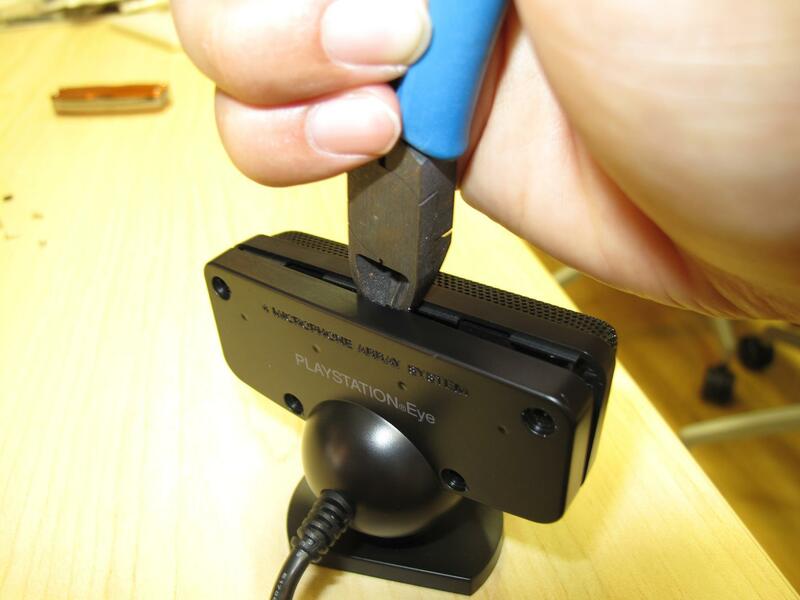 Me gustaría que alguien me ayude a construir la ps3cam, para cuando ya no pueda mover la cabeza. Hola José estoy investigando como conseguir los componentes (en Dinamarca) y tener listo uno para fines de noviembre 2017. Llegaste a averiguar algo adicional? Do you know If I can build it with any other camera? I can't find the PS3 Eye soon. Can anyone help me out big time and point me towards some resource that will teach me how to compile this for Linux?? I built it and want to donate to my hospital ICU, but i cant get it to run (because its compiled for mac), please help! Help ! when I try to run and compile the workspace RemoteEyeTracker, it is written : error 'exit is not a member of 'std'. I have the correct version of openframeworks and I did exactly what you said in the post below. I have a more recent version of codeblocks (13.12) but it doesn't have an influence does it ? Thank you for your answer. I have just download the version 10.05 of codeblocks but it still doesn't work. I got two messages : in function void initialize Quicktime ; 'exit' i not a member of 'std'.